This is a puzzle game developed for #gbjam 3 (Game Boy themed game jam limited to 160x144 resolution and 4 colours) and got #21 position in the overall rank. This is also July’s game of my one game a month challenge. The game requires OpenGL 2.0. Joysticks/gamepads are supported, although the game can be played with the keyboard just fine! Left and right arrows to move the spaceship. Down arrow to use the tractor beam (adds a tile to the bay). Up arrow or Z to fire the top-most tile in the bay. Press ESC to pause/quit the game. Uncompress the ZIP file and run “traxtor.exe”. Install the package and its dependencies and a Legend of Traxtor icon will be added to your games section. 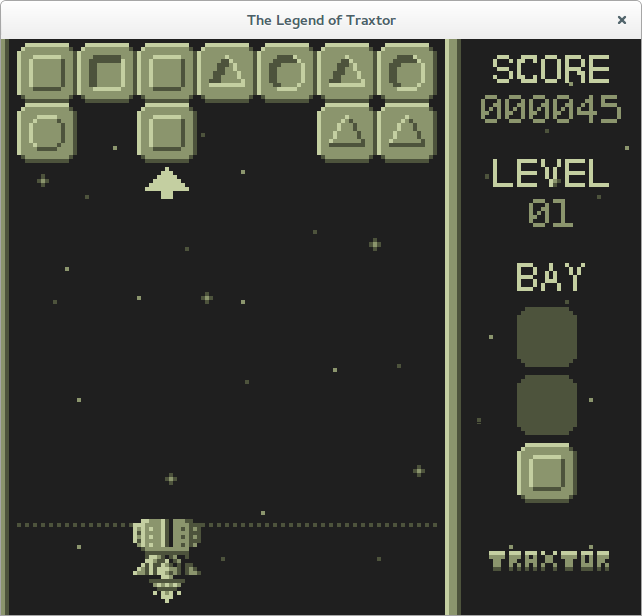 I made a conversion of this game for the ZX Spectrum: The Legend of Traxtor (ZX).